Yes, it's that time of year again where I have more zucchini than I know what to do with. I still have 4 in my fridge and more growing. I don't know why I planted 3 of them this year. I only bought two plants but one of them had two plants in it so I planted it too. I also planted (on accident) some acorn squash. It started growing out of my compost pile and I let it grow and grow and I don't even know how many plants are growing out of it. They are starting to overtake my potatoes which I had planted near the compost pile. I've never tried growing any other kind of squash besides zucchini or cucumber so wasn't sure how well they'd do and was curious if they'd produce anything. Surprisingly, they are doing quite well and there are a few that look nearly ready for picking. So next year maybe I'll expand my garden and try a few different types of squashes. 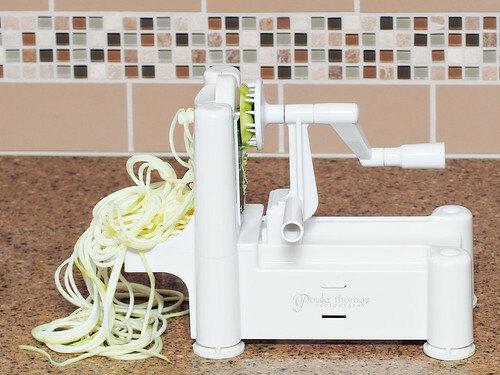 I got one of those vegetable spiral slicers for my birthday this year. I wanted to try making a zucchini salad and finally got to try it out last week. It works pretty well though it leaves about a half inch chunk with a long stem after you're done swirling. You can see it pictured below so it's not exactly waste free. 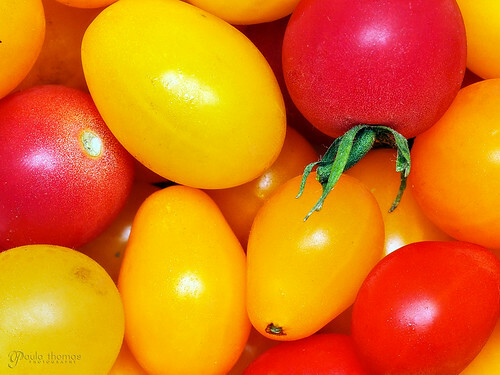 You can save that and chop it up and sauté it with other vegetables rather than throwing it away. 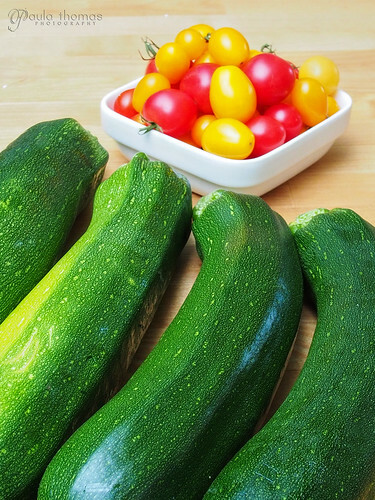 Zucchini is a very watery vegetable and it's important to get as much of the water out as you can so you don't end up with a really soggy salad. The best way is to salt it and let it sit for a while in a colander and then squeeze it out. The salad doesn't make that great of left overs either because even after drawing out the water with salt there is still quite a bit and overnight you will have a watery mess. It's still edible just not as good. 1. 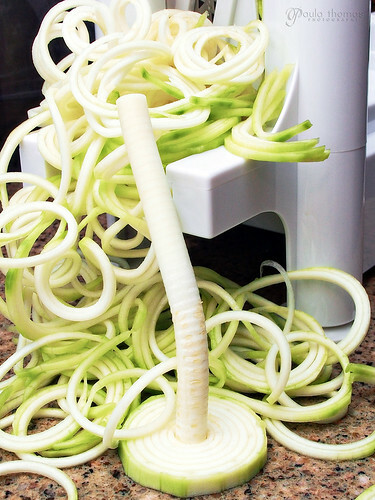 Slice peeled zucchini's into noodles with a spiral slicer. 2. 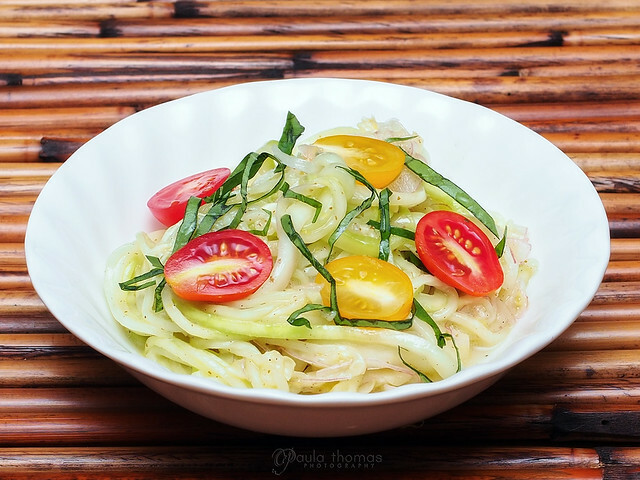 Put zucchini noodles in a colander and sprinkle with salt and toss. Let it sit in sink to drain for 30 mins. 3. Press noodles down into colander to remove excess water.